As you can see, Prof. Celia Oyler updated her blog post to remove the specific prompts and passage titles under legal threat from PARCC. But then where is the public accountability for PARCC itself? Quis custodiet ipsos custodes? The PARCC, which is supposedly a test of the Common Core State Standards, appears to have taken liberties with regard to grade level texts. For example, on the Spring 2016 PARCC for 4th Graders, students were expected to read an excerpt from[deleted under legal threat by Parcc] According to Scholastic, this text is at an interest level for Grades 9-12, and at a 7th Grade reading level. The Lexile measure is 1020L, which is most often found in texts that are written for middle school, and according to Scholastic’s own conversion chartwould be equivalent to a 6th grade benchmark around W, X, or Y (using the same Fountas and Pinnell scale). Even by the reform movement’s own standards, according toMetaMetrics’ reference material on Text Complexity Grade Bands and Lexile Bands, the newly CCSS aligned “Stretch” lexile level of 1020 falls in the 6-8 grade range. This begs the question, what is the purpose of standardizing text complexity bands if testing companies do not have to adhere to them? Also, what is the purpose of a standardized test that surpasses agreed-upon lexile levels? Summer 2016 1. Growth Mindset! Although the end of the semester had some moments of intense weirdness and we've had some family challenges (very elderly father-in-law is really having trouble), the summer has gotten off to such a good start. I am really glad that this summer is going to evolve week by week, going in whatever direction seems best! I think I'm going to need that flexibility for family reasons, and I've earned it too, ha ha: the past two summers I spent doing huge course designs (Indian Epics last summer, and Myth-Folklore the summer before that)... plus, I'm on a 9-month year to year contract, so it's not like the university even pays me during the summer anyway! So, this summer is the great SUMMER OF READING, and it's all about regrouping and reorganizing, just seeing what attracts my attention and lets me have fun! I'll be writing up these little weekly notes because the aimlessness (in a good sense) of the summer means that I might even forget what I was doing back in May by the time August rolls around! 1. Canvas. I signed up for migrating my courses to Canvas this Fall, so I am learning about Canvas this summer. I'm not really anticipating anything good about moving my courses, but it's hard to believe it could be any worse than D2L. My use of the LMS is totally limited (quizzes for students to declare their work, gradebook, and homepage), and it looks like my homepage is going to work with the same Blogger solution I used in D2L, so the next question will be figuring out the quizzes (especially changing the dates semester to semester and reusing the same questions across multiple weeks), and then the gradebook. I'm also carrying on with #OU_LMS16 at Twitter, and I Storify that every week: #OU_LMS16. 2. 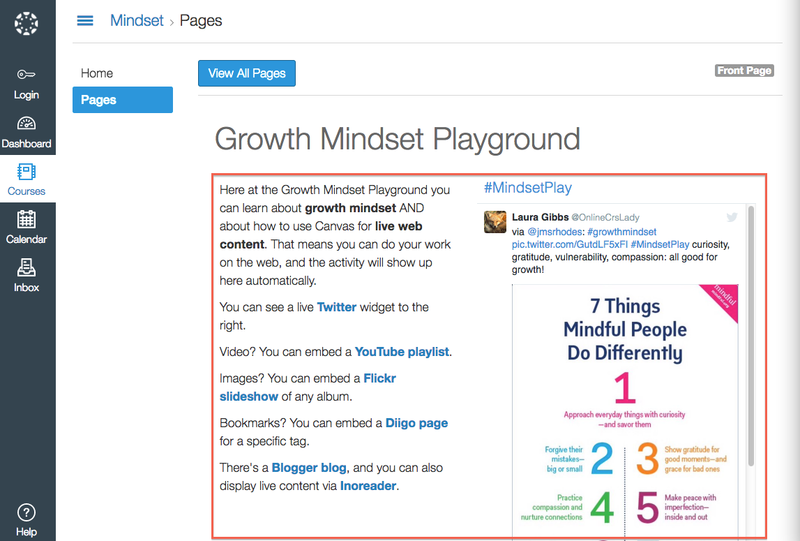 Canvas Growth Mindset Playground. Even though I am not a fan of the LMS, I realize that the LMS migration is a big opportunity for talking about course design, perhaps the last really big opportunity I will have for that in my career at OU. 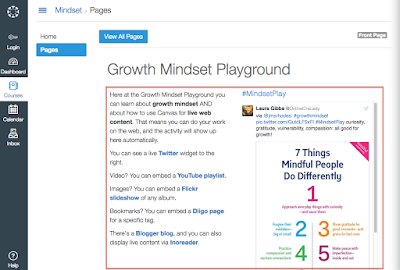 So, I would really like to be part of that conversation, and I want to lobby for two things: growth mindset as a design strategy itself, plus the use of live content in Canvas that is built with real tools on the open Internet (especially Twitter and YouTube). I've built a course in our sandbox, but I just learned that the sandbox will go away, so I'm waiting until our real course space is set up (next week?) and then I will be working on Canvas.MythFolklore.net more intensively. So far, though, I am really happy with the kinds of live content I am able to demonstrate there! 3. Growth Mindset Curation. I am having so much fun (re)organizing my growth mindset content and collecting new materials to share with my students. I reorganized my Growth Mindset Memes blog, and I set up a new blog: Growth Mindset Zone, which is both for the Canvas project but also as a resource center. I also decided that I was doing enough with growth mindset now that it justified having a new Twitter account: @OUMindsetPlay. I am excited about connecting with new people and building a new part of my PLN that is specifically focused on growth mindset. The more I learn about that, the more I want to learn, which definitely sounds like a reason for building a PLN. 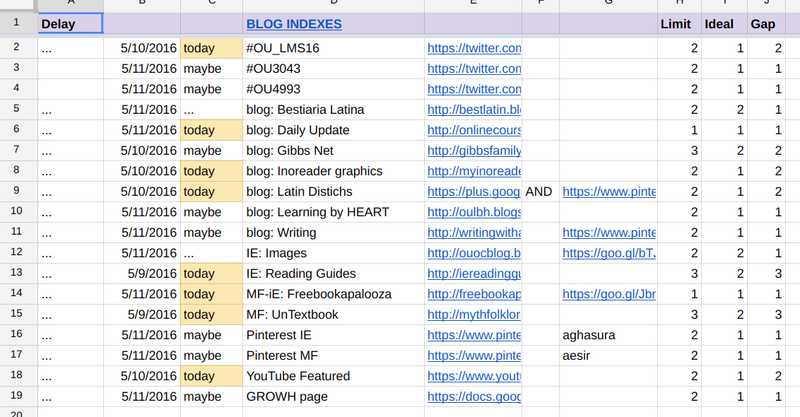 I've got a good daily routine going on with my blogs, Twitter, Diigo, YouTube, Flickr, and Pinterest so that by the time next year begins, I will have a much broader and deeper collection of resources to share with my students! And more cats, of course. 4. Reading. I listened to Proust and the Squid this week, which was excellent, and on my Kindle I am reading Devdutt Pattanaik's My Gita. I'll be starting a new Audible book today, but I have not picked it out yet. Too many to chose from! 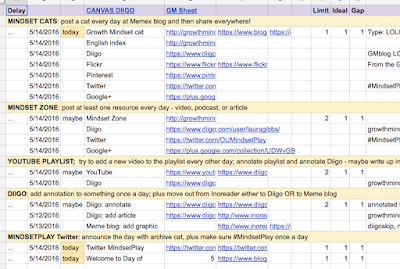 So, at the risk of appearing totally nerdy (Gotta stop myself I'm so nerdy), I thought I would share a screenshot of the spreadsheet that rules my life this summer. Unlike the spreadsheets that ruled my life last summer and the year before, I don't have a course redesign this time... instead: just reading, exploring, collecting, and having fun online! 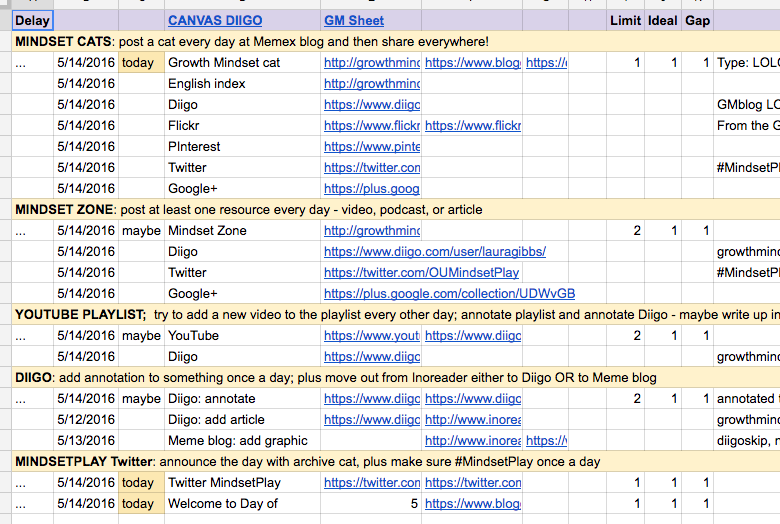 I've actually been using this spreadsheet during this past school year, and it's been a lifesaver! During the school year it's really hard to stay on schedule with my curation projects, but during the summer. So, right now it's mostly just a reminder list, as opposed to an alerts list letting me know where I have fallen behind. I have a list of projects I am working on: blogs, Twitter, Pinterest, and YouTube, along with my big Growth Mindset project (separate sheet of its own). 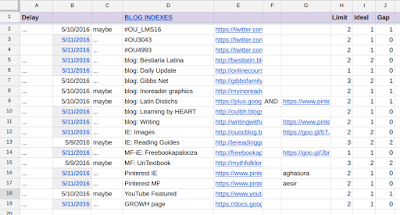 For each project, there's a link or sometimes two links that can give me what I need to check on my work and add to it; having the links right there allows me to do my work directly from the spreadsheet. 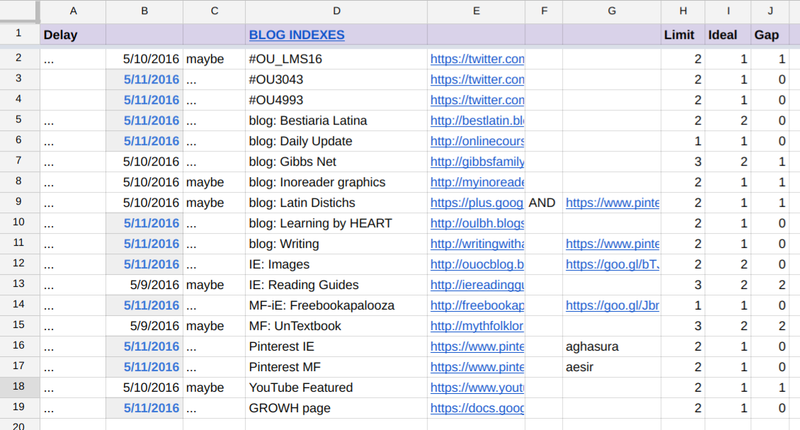 There's also a formula for each project where I identify the "ideal" frequency at which I work on that content stream. During the summer, they are all daily or every-other-day, but during the regular school year, they are more like once or twice a week projects. In addition to that ideal frequency, there is also a "limit" where I start counting days behind. So, a project might have an ideal of every-other day, but I cut myself some slack and don't nag until three days have passed. 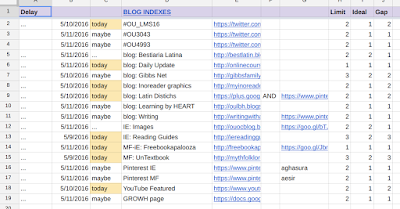 As I work on each project (adding a tweet or a blog post or a pin as the case may be), I update the date column (today's date appears in bold so I can quickly see which ones I've worked on today). There's a formula that then compares the date in that column and gives me the "gap" between the ideal and the actual date of activity. Then, based on the "gap" and the "limit" I get a prompt about whether or not I need to work on that area right now (either "..." or "maybe" or "today"). Finally, there's also a "delay" column that tells me how many days I am behind the actual limit I set for myself. During the school year, I usually get behind enough that every day I'm scrambling to take care of things that are delayed (which is why that column comes first, on the far left). Then, I take care of the "today" items. And I'm lucky to do all that during the regular year. But during the summer, oh, I have time for things! So not only can I keep up, I can even change a lot of the ideal frequency items to daily. And it's really just based on what I enjoy most, not because of any external imperative. I have so many fun things to work on. What I really like about this system is that it is totally forgiving. If I get behind, well, all I have to do is post something that day and, presto, no worries! The spreadsheet has no memory: it just looks at everything in terms of today. It's also highly automated with formulas. I can change the ideal and limit for any item when I want; everything else is formula-driven. I just enter the date, and the spreadsheet does its magic. It's kind of scary if I am online at midnight because that change in date updates all the formulas. So, especially during the school year, my nicely caught-up spreadsheet can turn to a bunch of "today" messages right at midnight, ha ha. If I remember, I'll add a screenshot later to this post that shows what it looks like when I am not all nicely caught up as I am now. This link takes you to the file so can see what I mean: pinterest.html. 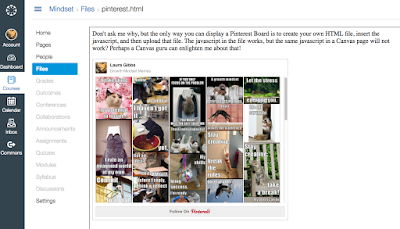 FWIW you can also see that the Pinterest Board renders if it is inserted into a Blogger blog post which is embedded via iframe. But when I put the exact same content of the HTML file into a Canvas page, the Pinterest Board does not display. You can see the result here: Pinterest test page. Is there anything I can do about the top of the screen in the Pages section of a Canvas course where the big blue "all pages" link sits now? It would be great if users could at least pop that space closed the way they can pop the left-hand nav bar closed. Do the numbers: if the user doesn't learn to suppress the left nav bar (which they have to do with EVERY NEW PAGE; it is not persistent), then that means out of 800x1200 visible pixels, only 550x800 pixels are my content. So, that is 440K pixels out of 960K pixels: I am getting to use less than half of the visible screen. Ouch.